Team Fortress Comics #1 ranks up there with the beginning of a jet-ski manual when it tells you how to turn on the jet-ski as one of the world's greatest literary works. Sometimes reading is its own reward. Not most of the time, obviously, but the Team Fortress 2 team believe that Team Fortress Comics #1 is one of the few times that it is. Team Fortress Comics #1, the first in a series of new 6 comics, is not the first Team Fortress 2 comic Valve have produced, but it's the first one not tied in to a major update. "But we think you'll agree this comic series deserves to join the menu at the Olive Garden, Fitzscott Gerald's The Great Greatsby, and the beginning part of a jet-ski manual that tells you how to start the jet-ski as one of the three or four things humanity has produced that's actually worth reading," promises Valve. 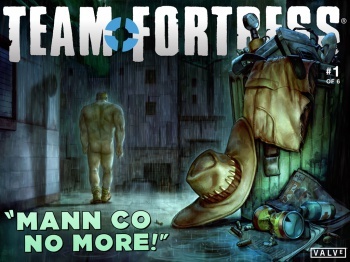 The story of Team Fortress Comics #1 revolves around the legendary Saxton Hale losing control of Mann Co. when he refuses to beat up a little girl. Our nine trusty mercs are fired by its new CEO, and scatter to their various corners of the world. Six months later, Miss Pauling sets out to bring the team back together, starting with everyone's favorite homicidal patriot: the Soldier. Despite what the Valve team said, this comic actually is accompanied by a Team Fortress 2 update, albeit, a relatively minor one. It adds "Chemistry Sets," an item that when combined with various other items, can transform hats from normal to "Strange" quality (strange quality hats track your scoreboard stats). You can download the comic as a PDF, a CBR, or just read it in your browser.